It’s been unacceptably too long since my last blog post and even longer since I’ve posted about running. I swear I have run since the Nantucket Half Marathon in October and I’ve actually had some great runs and fun stories to go along with them. I’ll start with this one. In case you didn’t hear, Boston had one of the worst winters in history and the most snowfall ever. 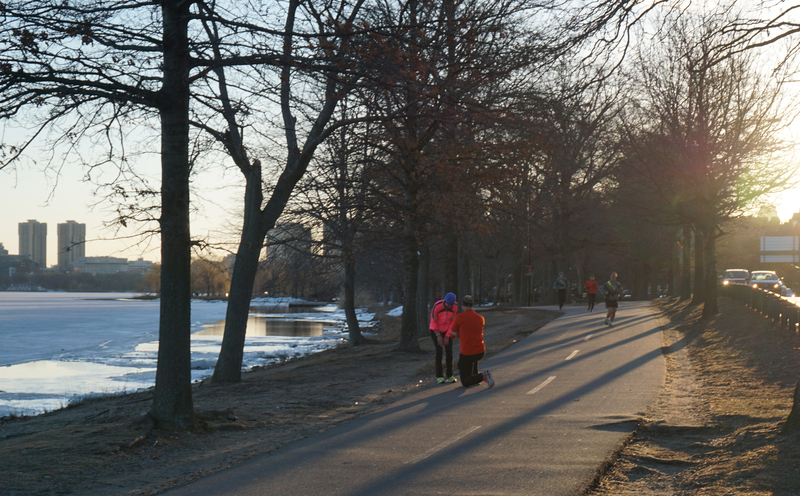 Over 110 inches of snow fell in Boston, some of it just melted recently, and that is just inconvenient for a runner. There was nowhere to go so even purist like me were forced on to the treadmill. I did a lot of yoga this winter. Finally it began to melt in March and although there were some flakes even in April, the roads became runnable again and the runners rejoiced. I took this selfie just walking to the grocery store or something. 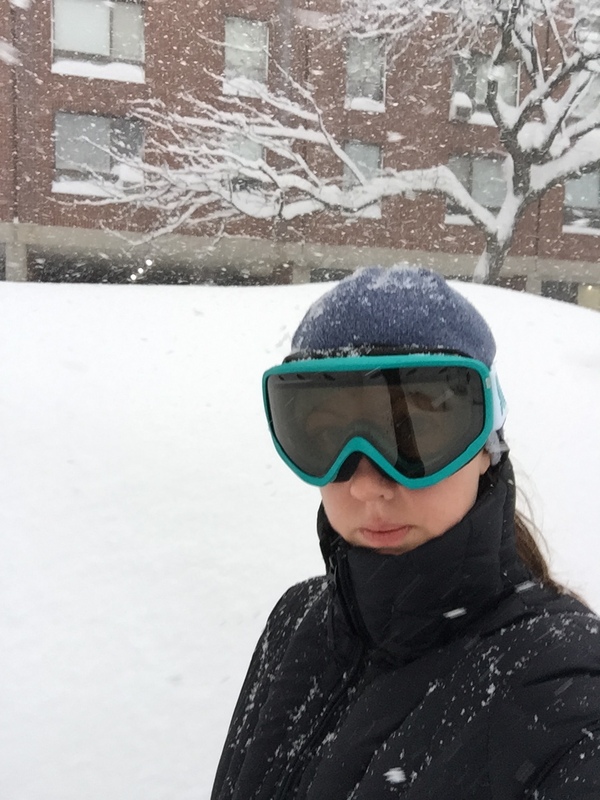 I’m wearing ski goggles because otherwise I would go blind from the snow. Jared and I had a half marathon scheduled for the end of May and at 8 weeks out we were a little anxious that we were running out of training weekends. 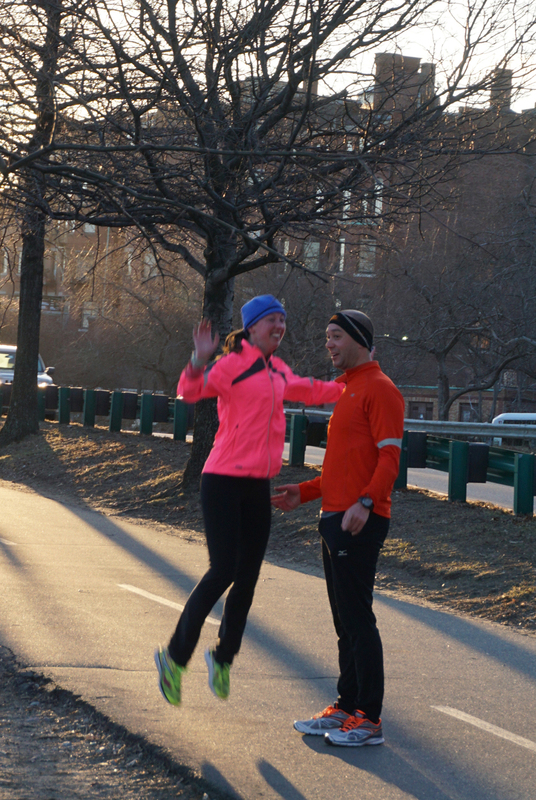 He suggested that the next Wednesday we run together but instead of our usual mid-week four miler, we extend it to six. I thought it was a great idea as long as we get out the door early so I could make it to work on time. That Wednesday morning (April 1st, also known as April Fool’s Day – foreshadowing) we headed out for our run at 6:30 on the dot. It was still pretty cold for April so I was nice and bundled up. The route was the same six mile loop we’ve been doing for years. Jared’s place in the North End to the Charles River, over the Mass Ave Bridge, to the Museum of Science and back to the North End. I can’t say I was looking forward to the run, but I was looking forward to getting it over with. When Jared and I run together I usually have to work to keep up with him but on this particular morning he was running so slowly. I actually glanced at him a couple of times to see if he was okay and his stride (his weird slow stride) looked very deliberate. I looked down at my watch to find that were averaging slower than nine minute miles. I didn’t want to ask if he was okay because it had been a while since we had run together so maybe he was just feeling sluggish and not having a great run. I figured we would probably speed up on the way home. This is a summary of what was going on in my head when I heard that: What? Is this a joke? This isn’t your actual proposal. This random flippant remark isn’t actually the proposal I have been anticipating for 6+ months. Right? … What is happening?!?! And then he said the worst thing he could possibly say. He said “April Fools.” He sort of proposed, but not really, and then he said April Fools. I can’t tell you what my next response was because I must have blocked it out. I remember my eyes growing terribly wide and I turned away (I was probably about to launch myself into the icy river). Jared grabbed my hand and said ‘Okay let’s do this properly’ and then he was down on one knee. Best moment of my life so far. For reals. Full disclosure, I can only share the rest of this story based on what has been told to me because I don’t remember any of it. I was in complete shock over the whole fake out crappy proposal followed by the April Fools and then trying to wrap my head around the idea that this was actually a proposal and maybe I should calm down and start paying attention. I forced out the word YES and then he pulled a stunning diamond ring out of his running pants. Yep, my perfect solitaire in a gorgeous classic tiffany setting had been bouncing around in the pocket of his sweaty pants all morning. I was completely overwhelmed and so excited but there was one more surprise. Before we left Jared gestured to someone who was hiding behind a tree, Brian Sage a local artist and very loyal friend had been on sight for the proposal to capture the moment on film. Jared knew how much a photo of our engagement would mean to me and Brian was kind enough to get out of bed on a frigid morning to beat us to the spot where Jared would propose. And that’s why he was running so slow…Ohhh. After a few more photos, our first as an engaged couple, it was time to run home. I was relieved to hear we would pick up the pace because I wanted to get back in time to call my Mom before she went to work. I ran the last three miles with my left hand clenched in a fist to protect the ring and drilled Jared with questions about how it was planned, who already knew and what on earth was he thinking yelling ‘April Fools’. Everyone asks if I knew it was coming, and on some level I did. We had been making plans for our future together for a while and I was growing anxious for a proposal. Still, in the moment it was unexpected and more perfect than I could ever imagine. For those who know Jared, you know that it was just about as ‘Jared’ as the proposal could be. 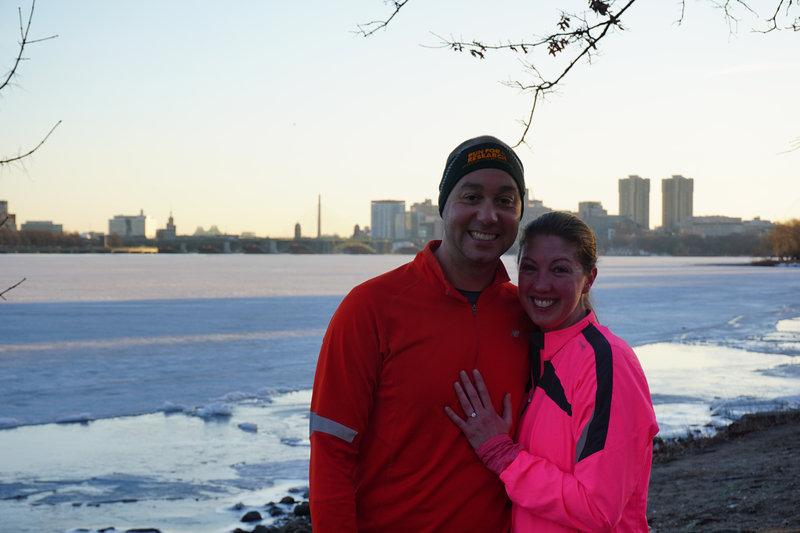 For him to ask me to marry him during a run on a route we have run together since we had met six years before was simply perfect. It was truly the best run ever and one I will certainly never forget. Especially since it seems we will be running together for many many more years.